I’m not sure this airspace addition will reduce the risk of a midair collision. In fact, I think it might do just the opposite. While ostensibly protecting airplanes on the instrument approaches to runway 30, it will force non-participating aircraft into a smaller chunk of sky. I’ve heard they are expecting to implement this change without much, if any, increase in staffing at Socal Approach. Considering the volume of traffic in and around Long Beach, I can only assume Socal will be unable to provide services to aircraft in local practice areas. This will force them down below 2400 feet over the harbor, and below 1500 feet off the Huntington Beach coast. At that altitude, they will be mixing it up with banner towers and helicopters. In addition, lower altitudes equate decreased glide distance for single engine airplanes. So they will stick closer to the coast, causing further congestion. Transiting aircraft will be forced upward and having to live in the airspace between 3500 and 4900 feet. 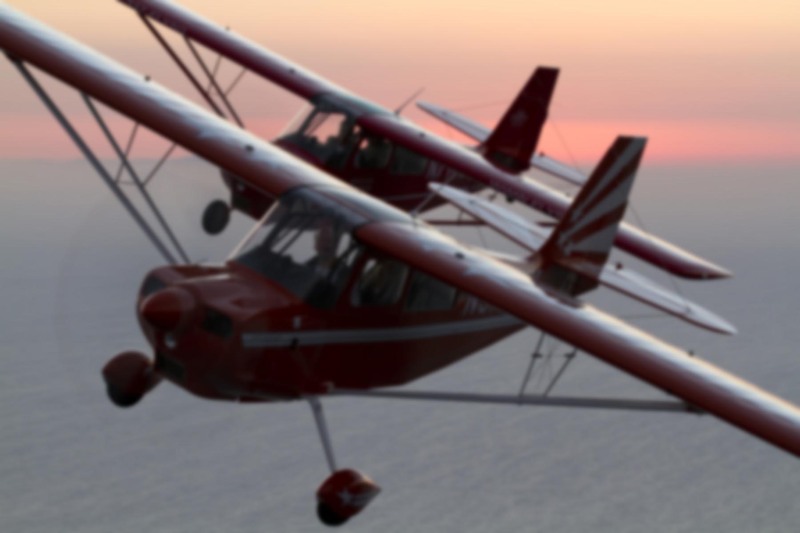 Should training aircraft elect to fly above the Class C airspace, that will add to the logjam as well. It’s also worth noting that these are the aircraft which are most likely to be flying without traffic detection equipment. There are a few other odd things about this proposal. The Los Alamitos class D airspace appears to be reduced to a pie-shaped slice. I’ve not seen that before. The west side of the field will be class C while the east side remains class D.
Speaking of Los Alamitos, I can’t help but wonder how this will affect the Medfly operations in and out of that airfield. Our operations probably contribute to the perceived need for this airspace. We routinely fly in and out of Los Al to the south at 1000′ MSL. We have north/south regions over that area which we fly at 1000′ and/or 2100′. These are standard procedures for us, all of which were designed with ATC’s input and which we fly while talking to them and with their full assent. It may give the airliners an occasional RA (resolution advisory) or two, but I’ve never felt it was in any way unsafe. There are certainly times when adding airspace is necessary. For example, I wouldn’t mind seeing a class D tower added at Corona. But I’m not sure this Long Beach thing is such a good idea. I’d be interested to hear from other Socal pilots. What’s your take on this proposal? It would be a lot more useful silmpy to be able to see parts of the database on Google maps (hiding most features when zoomed far out do you have any way to distinguish big airports from small ones?). Having seen what a cluster this airspace can be now, I wonder if this isn’t just going to make matters worse? Cramming more airplanes into increasing smaller chunks of sky are just going increase the likelihood of collisions. And my guess is that LGB’s tower, which seem to be the least GA friendly in the area will get worse as their workload is increased to police their new airspace. I agree with your assessment of Long Beach’s tower. Not exactly the friendliest cab in the basin. However, I’m not sure the airspace grab would be so bad for them from a workload standpoint. Once Class C airspace is in effect, pilots will no longer be able to pop up out of the blue on LGB’s frequency; they’ll have to go through Socal first, and the approach controller will handle the transfer to the tower. The airspace classification shouldn’t, in and of itself, cause an increase in arrivals or departures. So they might be better off. I think Socal is the one who will suffer the most if their staffing isn’t increased. In my mind, 124.65 already ranks as one of the busiest frequencies around. My jaundiced view is that this is, once again, a political creation; providing the public with a ‘feel good’ gesture that their travel on airliners is now safer. Kinda like the whole TSA security theater debacle. Our safety in GA and the inconvenience to SoCal aren’t the concern of those higher ups in the FAA that are imposing this Class C. A couple of us drop out of the sky after a collision outside Charlie and that’ll just be one more nail in our coffin. We’ll just get restricted more. I’ve been flying in socal since the days of TCAs and the VOR at SNA; it has just become more and more restrictive without a demonstrable increase in safety and I see nothing that is going to change that trend. The politicians and the public just don’t care about the 0.2% of the population that fly. P.S. Where the heck have you been? As for where I’ve been: mainly in the air! Logging a lot of hours lately. But I hope to be here a bit more as well. Ah, you can’t fool us. You’ve been spending time with your beautiful new bride. Who can blame you? 1) South departures from Los Al give less than 500 feet altitude separation from the ILS 30 into LGB – that doesn’t seem to make sense. The current “if Los Al is open, talk to them east of the 605” should be charted. 2) My perception is that noise abatement is more important than safety to ATC. 4) The proposed airspace will not provide enhanced safety to those who do not use its services. There seems to be a common aversion in the pilot community (my perspective is from being a full time military helicopter pilot and part time GA fixed wing pilot) to talking to ATC. Understandably, if everyone flying tried to talk to SoCal, it would likely overload the system. However, I never have a problem getting a squawk over the Long Beach practice area or while holding VFR. It costs me an extra couple turns to avoid traffic, but is well worth it to have someone else helping me look out for other aircraft. 5) SLI and LGB towers don’t seem to communicate. When transitioning one to the other, the 2nd tower usually has no idea you are coming. I hope whatever “solution” becomes final considers the safety of all parties. A small plane midair is just as tragic as an Airbus crash. The media just likes that latter better. Really the only chunk of air the airlines need/want is a narrow band for the arrival and departure. They just tend to get a wide berth because of a very few pilots who don’t have much situational awareness. Good to hear the perspective of a rotary-wing pilot, Barry. When even the helicopter guys feel like they’re getting squeezed, you know something’s not right. 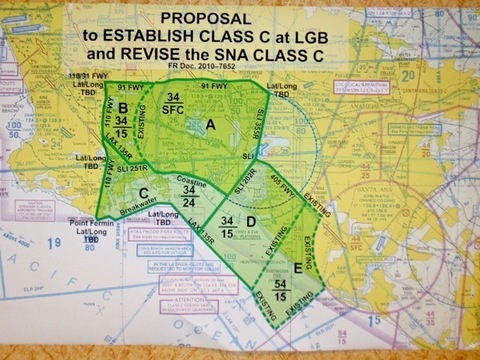 I would assume that the proposed change would mandate better coordination between Los Al and Long Beach, with the current Los Alamitos delta airspace being largely co-opted by Long Beach’s class charlie surface area. I suppose that might be a plus — but it’s about the only one I can think of. Thanks for your thought on the issue! As a member of the airspace users working group, I can guarantee all of you this is not the design we submitted. In fact, the class C idea was dropped in favor of doing a class B, class D proposal. This has never been done before. The FAA realized this and went back to the class C proposal without telling the group. They altered the drawing….they even screwed it up. It was embarrassing. The initial reason for a chnage in airspace were complaints lodged by Jet Blue for having too many TCAS RA’s while operating in the Long Beach area. They would not give the group proof of these TCAS events. I personally filed FOIA requests for this data from the FAA. The FAA data did not show a TCAS problem at all. Jet Blue is manipulating the FAA to change airspace to suit them, not GA. Please submit your comments to the FAA before July 31, 2010. If you need an address, please visit http://www.scauwg.org. There is a set of federal procedures designed to make sure that all of the stakeholders have a way to provide appropriate input to the FAA as part of the process. This document is FAA Order 7400.2G. The FAA did in fact intentionally violate these procedures denying access to the actual airspace overlay maps until the night of the meeting. This did not allow the pilots commercial, corporate and private the mandated advance access to the proposed changes in order to provide meaningful input to the FAA which was the stated purpose of the meeting. This is viewed by the pilot community as a attempt to inappropriately conceal the information since they feel they will get a lot of resistance from the pilot community. The second issue is basically a bait and switch issue. The FAA staffers and managers came to the meeting with charts depicting the proposed airspace changes and the boundaries thereof. In one location the text description of the edge of these boundaries does not match the airspace as shown on the maps in particular the southwest boundary that is identified as the 135LAX radial which is mapped as the 122 LAX radial When directly asked about the discrepancy (Which is it, the green boundry on the map or the incorrectly mapped 135 LAX Radial) they replied that the 135 number was correct This is a HUGE discrepancy which will add many additional square miles to the airspace being grabbed. The FAA has done NO ENGINEERING STUDY to show that these changes are safe, workable, or needed. The Southern California Airspace Users Group an advisory group comprised of both government and private stakeholders providing input to the FAA on these issues never saw any of these proposed changes until the night of the first meeting and a informal poll of it’s members find the majority do not favor the new FAA’s plan since it seems to be skewed in favor of Jet Blue with out adequate operational and safety considerations for the general aviation fleet. An analysis of the actual TCAS incidents (which had to be acquired by FOIA, Freedom of information act) SIMPLY DO NOT SUPPORT Jet Blue’s claims. If this is needed, Fine. Just show me the need, show me the data, show me the engineering study supporting the changes taking into account operations and safety for General aviation and then follow the rules that are in place for changing airspace. NONE of this has been done. The FAA should not start changing the National Airspace plan simply because one airline has complaints with out an appropriate engineering study and adherence to the process outlined by the FAA themselves. Thanks for the information on that LAX135R discrepancy, Dave. I just looked at the difference between the two on Skyvector.com, and you’re right, it’s a major difference. The bottom line is that VFR aircraft in the Long Beach practice area were already squeezed into a small sliver of airspace below airliners and above the helicopter/banner tow altitudes. Unless there is a major increase in staffing and frequencies at Socal Approach, this airspace only makes things worse. Mark my words, it will CREATE midair collisions, not prevent them. You are the fourth person to state that JetBlue is behind this. One concurring source is within the FAA, one is a DPE, one is a local CFI, and then there’s you.